The world pours into our body, its senses, all day, everyday. The irony is that the same neural processes that protect us from a deluge of stimuli also prevent us from seeing much of the world as it is. Aided by highly personalized bursts of rich-media, our individual and collective faculties have been lulled into a cycle of individual and social narcissism, with implications that run from simple appreciation of art and culture to disintegration of healthy democracies. This article will discuss how different forms of media art disrupt these processes, to recast the work as ambient media art (AMA). Through different sources, from HCI research to advertising to musicology to define AMA, the author looks at how AMA steps into that moment prior to what Gerald Edelman has described as Neural Darwinism, foregrounding our attention with something to thwart, even momentarily, "our right to blindness," and open opportunities for more fruitful interpersonal and social discourse. The world comes pouring in, redlining our senses. Powerless to prevent the deluge, we have come to depend on a set of adaptive neurological processes that if allowed to power down would leave us paralyzed in a house of mirrors . Ironically, these same brain processes that allow us to get on with our daily life also make us blind to much of what goes on in the world. Add to this the increased narcissistic tendencies brought on by an incessant media environment easily customized to our idiosyncratic angles onto the world, in addition to a growing tendency to migrate to like-minded social communities (both physical and virtual), a problem emerges in our abilities to attend to the world. The projects included in this essay propose to disrupt the innate masking off of different parts of the everyday with what are identified as ambient media art (AMA). AMA pre-empts the neurological processes that shape our attention, to overcome "our right to blindness" with something more provocative or poetic, in order to unlock and prompt fruitful opportunities towards individual growth and social discourse. The defining issue of our time is not the Iraq war. It is not the "global war on terror." It is not our inability (or unwillingness) to ensure that all Americans have access to affordable health care. Nor is it immigration, outsourcing, or growing income inequity. It is not education, it is not global warming, and it is not Social Security. The defining issue of our time is the media. We have gone from three main television networks and a handful of newspaper outlets that looked and sounded much the same, to hundreds of cable access programs, thousands of reputable news web sites and countless blogs, a media landscape ripe at the very least in perspective. Yet as our access to media has increased, our capacity to learn and comprehend is self-challenged in ways we are unaware. In her research on 'Shout TV,' University of Pennsylvania Professor Diana Mutz found that the emotion generated by 'in-your-face' television, say in the clamor of a Jerry Springer Show, impairs our cognitive abilities. Perhaps the confrontation is enjoyed as an American form of criticality, but with this impairment comes a real and immediate problem in 'Shout TV' and the increasing polarization it and other forms of media represent in the U.S. : we no longer engage each other for opposing perspective, we "surround ourselves with ourselves" . Our relationship to media has become highly problematic, making the job of sorting ourselves from our self that much more seamless. Examples are readily available. The Center for Disease Control determined in 2002 that myths regarding various diseases were preventing prevention itself. The CDC published and circulated literature to dispel such myths but in an associated study, it was found that the pamphlets were actually contributing to perpetuate the original impressions. Repetition, it seems, has a way of reinforcing what is believed, regardless of the content. Search engines implicate the best intentions, only to open up critical issues in censorship. For example, government agencies routinely database research that in most instances is open to its citizens. But if a middle manager presiding over the publication of an organization's database finds that this research might support a personally objectionable issue, he/she can, with a quick keystroke, excise a search term like "abortion" from a related-keyword search list. Unless you know the technical term X, all articles related to abortion will no longer surface. A recent study from Pew and its Forum on Religion and Public Life also confirms how free-wheeling we can be at interpreting media, especially media closest to the heart. In the survey asking among other questions, "What it would take to achieve eternal life," only 1 percent of Christians said living life in accordance with the Bible, choosing to find their path to heaven on their own terms. "With a huge range of media choices today," Dr. Mutz continues, "Americans can self-select what they want to hear, reinforcing their beliefs rather than broadening them with differing view points" . More has become less. "Serious" news, delivered through talk show formats, is the latest media spectacle. The news spectacle generates a forum not for learning but continued entertainment, where our pundits reassure us with our opinions (and condemn those that are not). Mired in mass narcissism, one can argue that we are faced with a range of mental disease, stemming from wrongful associations, of pandering from a state of strength, of one spectacle confused with another, enabled not just by social, governmental or medial outlets, but through natural adaptive brain processes, otherwise thought of as neural Darwinism . Neural Darwinism explains human intelligence and consciousness through a combination of Darwin's theory of natural selection and the evolution of neural states. Gerald Edelman, Nobel Prize-winner and a leading neurobiologist, has a fairly simple way to think about this process: "Neurons that fire together wire together" . The more we become interested in a particular subject, the more we want to know more about it, i.e., a Sunday morning talk show in line with my political interests leads me to look further into a special guest's background. Makes sense. The opposite also implies something sinister however: neurons not stimulated or strengthened by our individual interests or environment 'go dark.' This process is likened to a 'pruning' of sense experience, and neurons can strengthen or weaken its family of neurons. This process of pruning does not necessarily kill off the interest in a subject (building evidence says it does not), but it does mask the awareness of it. We need this process of unconscious censorship to work as well as it can. Inundated with the world's stimuli, if we didn't have it we would go literally insane. Yet, the process can also leave us in harm's way. How might this happen? Take for example the first day of work. We must attend to many details, the most crucial being to show up on time. This requires knowing the path to take getting there. The first trip can (seem to) take the most time; as we get used to it, we habituate the number of lefts and rights, the time it should take to make a left, the time left after we have finished the turn, etc. All of this information is logged by the unconscious, and the more we repeat the trip, the more we can feel like we could do it blindfolded. With these trips mapped, the unconscious is freed up to take in other sights, targeting certain portions of the scene (shown to be 3 or 4 max.) according to other interests/memory associations, and leaving out or defocusing more with an increased comfort level. Our unconscious constantly pares down all kinds of information and sends forward to the conscious part only the information needed in order to get to work. This process works in any of our daily activities, most readily in the media we read. When we scan for a television show, channel after channel, neural Darwinism is at work sorting out the worthy from the worthless. This is most probably a gender trait (take it up with Darwin), but have you ever seen a female be equally appalled and amazed with a male's ability to scan through 300 channels of entertainment and find the one channel with the desired Asian soccer match. How did he do that? Neural Darwinism (and a visual system built for hunting game)! The thing is, we all see a ton. We just don't know it. Studies have shown that we possess an amazing ability to scan through many images, going well-beyond a supercomputer. This ability has led to military-based applications, to spot anomalies in transport security for instance. We see what might be anxious behavior, maybe even the outline of a weapon, but it doesn't really seem different to our own anxious behavior, and the outline could have been a blow-dryer. The alert dries up making room for the next stimulus to be interpreted. Apparently, when we are outfitted with a skullcap of wires measuring blood flow in the brain and hooked up to a computer trained to sense those alerts emanating from our unconscious, we turn out to be formidable machines at spotting terrorists attempting to board a plane. If America has never seen this kind of social polarization since the Civil War, then we face an uphill climb to re-cultivate a social realm. For Walter Benjamin or Guy Debord, the modern spectacle acted as antidote to 20th century forms of alienation. But they didn't note a difference in a healthy collective or a narcissistic nation. The cohesion provided by a phenomenon like spectacle created the veneer of substance in a democracy; spectacle without a true collective would seem to foster another dystopia. We are natural spectators, caught in what Walter Benjamin identified as "reception in a state of distraction" . 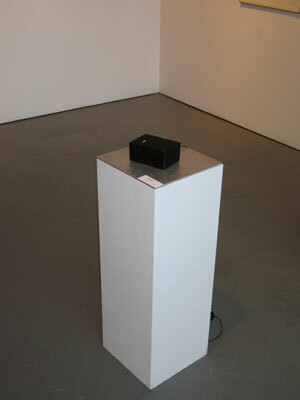 Benjamin considered the proliferation of media as a saturation of the horizon, "the desire of contemporary masses to bring things 'closer' spatially and humanly, which is just as ardent as their bent toward overcoming the uniqueness of every reality by accepting its reproduction," and serves to expand our abilities to perceive. Yet, as Jonathan Crary pointed out in his book, Suspensions of Perception, "spectacular culture is not founded on the necessity of making a subject see, but rather on strategies in which individuals are isolated, separated, and inhabit time as disempowered" . Perhaps this is how the 21st century spectacle has become so much more efficient than its 20th century predecessor, for now the spectacle, at least in America, not only makes us feel unfamiliar with it (when we are), while at the same time making us feel like we are familiar (when we aren't), it also imbues a sense of substance, that by sheer volume and repetition, makes it more convenient to find and communicate with others who look and sound like us, without the fabric that 'social relations' require to live and breathe. Clearly, the 21st century version of spectacle is not the same animal that Benjamin had in his sights, and combined with the pruning of sense experience, puts us all in a precarious position to judge what goes on around us, making it exceedingly easy to mask off dissenting voices. One begins to see how an assault on our individual and social well-being can easily take root with us complicit in its future growth. An ambience is defined as an atmosphere, or a surrounding influence: a tint. My intention is to produce original pieces ostensibly [...] for particular times and situations with a view to building up a small but versatile catalogue of environmental music suited to a wide variety of moods and atmospheres. Whereas the extant canned music companies proceed from the basis of regularizing environments by blanketing their acoustic and atmospheric idiosyncrasies, Ambient Music is intended to enhance these. Whereas conventional background music is produced by stripping away all sense of doubt and uncertainty (and thus all genuine interest) from the music, Ambient Music retains these qualities. And whereas their intention is to 'brighten' the environment by adding stimulus to it (thus supposedly alleviating the tedium of routine tasks and leveling out the natural ups and downs of the body rhythms) Ambient Music is intended to induce calm and a space to think. Ambient Music must be able to accommodate many levels of listening attention without enforcing one in particular; it must be as ignorable as it is interesting. Eno's last comment, that Ambient Music must be "be as ignorable as it is interesting" distills best what Debord saw in spectacle, how it increases the potential for the nearly silent alert sent by the unconscious part of the brain to be heard; and how AMA can pick up on similar qualities: highly contextual, portable and time-specific, AMA is eccentric, sometimes uncertain, seemingly lacking conviction, contemplative and poetic. AMA is also "ignorable as it is interesting," un-monopolizing, floating between foreground and background attentions, and takes advantage of our natural ability to glean information from our immediate environment without focused effort. Above all, AMA creates alternative places to interpret, even interrogate, information and its context. We have become so savvy at disregarding the media landscape, of knowing when a door-to-door salesman resembles a popup ad, that we unconsciously turn a blind eye to a plea for attention. And when we 'find' media that speaks to our interests, we just as easily shutter ourselves from it. Operating on the fringe, AMA works in the realm of background processes, to craft juxtapositions that can catalyze issues-oriented discussion and disrupt our selective masking. In the end, the battle is between the ears. Knowing what we have to protect should be simple. We Americans have become masters at protecting our personal interests to the detriment of those at the social level, simultaneously enslaved by those qualities we abhor in our Protestant self and in the government we elect to represent us. The projects in this monograph focus on one particular problem, of our right to be blind in the face "surrounding ourselves with ourselves." This problem can be broken up by various forms of ambient media art, offering periods of defocus and intense focus, with greater potential of catalyzing social action to balance the apparent need to be with one's selves. Some examples of AMA included in the Gallery section of this issue make use of a custom media engine to create mediaDrifts, continually refreshed juxtapositions of randomly-chosen copy and image. Similar to William Burrough's Cut-Ups , particularly in film-form , mediaDrifts operate in the realm of Guy Debord's notion of dérive, literally "drifting" as, "a technique of rapid passage through varied ambiences" . While Debord's drift was more physically driven, his concept works for AMA, especially when he elaborated that, "dérives involve playful- constructive behavior and awareness of psychogeographical effects, and are thus quite different from the classic notions of journey or stroll" . mediaDrifts are simple little stories that breeze along at a fast clip, catching one's attention at odd moments with what seem like strange references to current events, forcing the viewer to make sense of the fractured media combinations. The text comes from news sources like New York Times, Newsweek and email spam excerpts; the images are from sources like Reuters and the public domain. Text can be stylized with some script fonts for a more personal voice, but normally the lines of copy are displayed in simple Helvetica, the voice of authority. Photographic imagery are blurred to comment on "deep focus" and its analogy to democracy , to enhance the effect on our desire to make sense of the image when few hints exist. 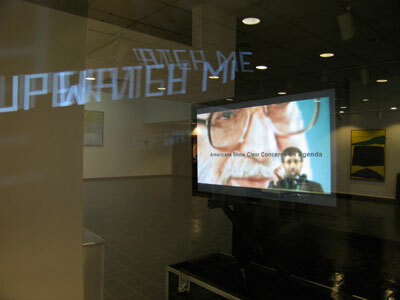 Depending on presentation, mediaDrifts include interstitial panels that display first-person lines like "hold me," in between the image/text panels. My AMA blend text, imagery and context with reactive sound and display to retrain viewer sense habits. More sound:more talk:more definition; and conversely, less sound: less talk: less definition. The work might promote rudeness, with increased use of things that make more noise, like a car horn on the street, or a cell phone in an office lobby. The goal is to promote participation in the public realm, to contribute to a conversation, to push a viewer to ask around for clarity. Further, Closer v1.2 is from the series kBox. A small light randomly blinks from the top; stepping closer, the light starts to resolve into a moving image emanating from inside the box. The challenge is to make sense of the moving image that, the closer one gets, the softer and less defined the image becomes. 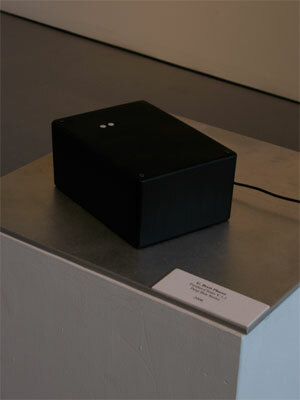 Here, Full v1.0 consists of a 28x28cm colored wax slab with a contact mic embedded inside. The contact mic is then connected to an Apple Mac Mini with MaxMSP running. 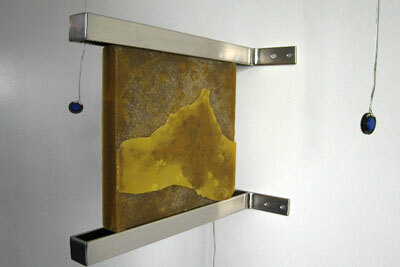 The sound is manipulated in Max and then routed instantly back to small speakers hanging alongside the slab. As neurobiologists have shown, our brains enable a process where "the inhibitory neurons are not just brakes, they can also be used to steer" . The unconscious acts not just as the domain of fantasy as its Freudian legacy has burdened it, it also acts as our own personal Law giver, bringing us to safety while preventing us from experiencing much of the world afresh. Ambient media art exists to be seen, but its juxtapositions and puzzlements are about catching yourself in the mirror, glimpsing something from the corner of your eye, awareness of connections and associations previously unknown. To what end? To re-energize media interpretation, to increase understanding of context, to cultivate the desire learn (again). Utilizing traditional devices/channels that point back at its source, my work allows a viewer the opportunity to struggle with issues and ideas, to be critical of the beauty masking the message, to see the message obscuring the context. Remixing and randomizing, my work takes from the world its headlines and imagery and combines them with familiar materials, to reveal how they contribute to the maintenance and fortification of our right to be deaf, dumb and blind. Perceiving the world is the first step to action, to loosen our self-imposed blinders and see the world as it is. Virilio, Paul, tr. Julie Rose. The Aesthetics of Disappearance. Semiotext(e) Books, 1991, p. 47. Yumiko Yoshimura, Edward M Callaway. "Fine-scale specificity of cortical networks depends on inhibitory cell type and connectivity", Nature Neuroscience 8, 1552-1559 (01 Nov 2005). http://dx.doi.org/10.1038/nn1565. If shown the scene in its entirety, there is evidence of how neurons also induce schizophrenia. Virilio, Paul, tr. Julie Rose. Open Sky. London: Verso, 1997, p. 96. A basis for an ethics of perception, "it would surely be a good thing if we ... asked ourselves about the individual's freedom of perception and the threats brought to bear on that freedom by the industrialization of vision.... Surely it would then be appropriate to entertain a kind of right to blindness...."
Foser, Jamison. Media Matters, May 26, 2006. "A Country Divided: Examining the State of Our Union," 20/20, ABC News, June 30, 2006. Edelman, Gerald. Wider Than The Sky. Yale University Press, 2005, p. 33. Crary, Jonathan. Suspensions of Perception. The MIT Press, 2001, p.3. Ishii, Hiroshi. and Brygg Ullmer. "Tangible Bits: Towards Seamless Interfaces between People, Bits and Atoms," MIT Media Laboratory, Tangible Media Group, 1997. Wehleit, Kolja. "Ambient media: the key to target group communication," Admap, May 2003, Issue 439. 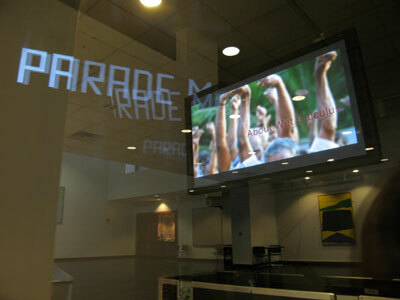 This article traces the development of ambient media from 1995 to 2001. Eno, Brian. Music for Airports. liner notes, September 1978. Anderson, Jon Lee. "Letter from Beirut," New Yorker, Issue of 2006-08-07, Unattributed quote. The Cut-Ups, 1966, UK, Black & White, Cinematography: Antony Balch, Screenplay: William S. Burroughs. Debord, Guy, "Theory of the Dérive," #2, Situationist International Anthology, 1958. Film theorist Andre Bazin said that Gregg Toland, cinematographer for Orson Welles among others, brought democracy to film-making by allowing viewers to discover what was interesting to them in a scene rather than having this choice dictated by the director. Brett Phares is an artist working in computer visualization and installation. He has shown at different venues such as SIGGRAPH Asia and Chelsea Art Museum NYC, and is preparing a solo show for Fall 2010 at Southern Oregon University; he also writes, curates and lectures on art, science and technology. After nearly two decades creating innovative interactive media for big commerce, he is now a professor of Media Arts at Marist College. See mrphares.com/YDA for more information or to leave feedback.